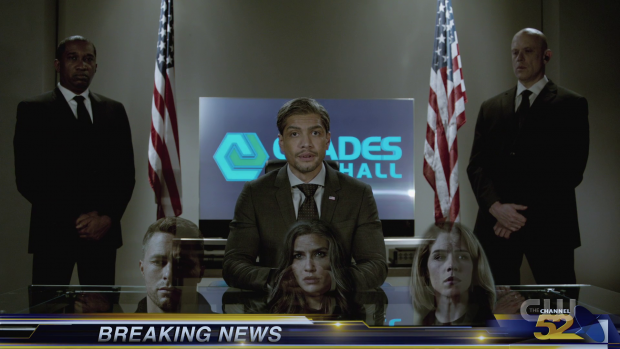 Arrow devotes an episode to the future timeline to explore Mia in a more detailed way as the deadline to save the city approaches. This show is nothing if not formulaic. Every season that has featured ongoing stories from a different time period has taken a full episode to further that plot while the present day is completely ignored for the duration. It’s probably necessary for actor availability along with other logistical considerations and it’s a good way to propel a story that receives mostly background focus onwards. The episode begins with Mia’s birth which makes for Oliver’s only appearance in this entire episode. What happens to him in the future remains a mystery likely as an ongoing tease for the deal made in the recent “Elseworlds” crossover event that will come into play during the upcoming “Crisis on Infinite Earths”. 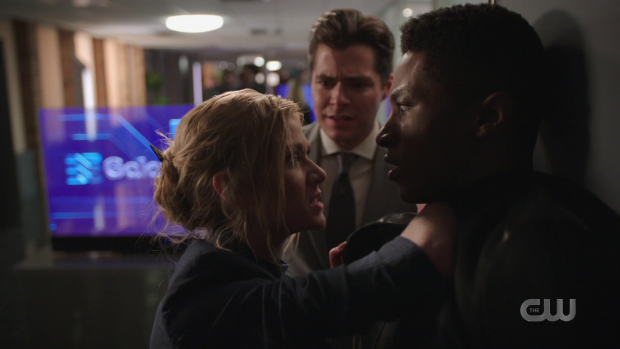 The almost lack of mention of him throughout this episode is somewhat jarring as neither Felicity or Mia seem all that upset that he isn’t around which comes across as if he’s on an extended business trip so the handling of this could be better but it must be difficult to find a way to address it without dropping serious hints as to what will happen from the audience perspective. After witnessing her birth there is an extended montage of her growing up and being trained by Nyssa throughout her life into adulthood which answers the question over where she gained her skills. 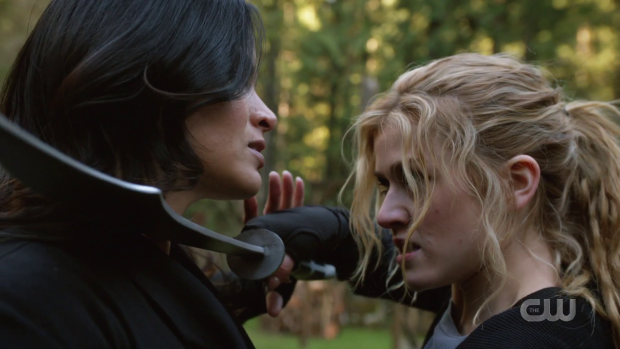 It makes sense for Nyssa to be the one to train her and suddenly makes her skill level difficult to question. It’s a well shot montage that gives some idea of her upbringing but also acts as an example of a typical Arrow problem. It’s another instance of development being rushed to get to a predetermined point so a lot of the depth is lost. We have no idea what Mia’s connection with Nyssa was like nor do we get a true sense of her relationship with Felicity. It is established that they live a somewhat reclusive existence in order to protect Mia from the possibility of others finding out who her father is but there’s no sense of how that life works. They only spend two scenes together before Mia runs off to Star City after learning that her mother aids vigilantes. There’s no grounding for her dislike of vigilantes or any sense that a close relationship is being torn apart by Mia’s decision so the episode completely fails to make this worth investing in. The episode makes out as if her leaving was a tragic separation but it doesn’t come across. This should have been committed to or left for the viewer to wonder about as these scenes don’t add any greater understanding that justifies their inclusion. The real meat of this episode comes from the Mia/William relationship. Their dynamic is fairly new but already very strong. 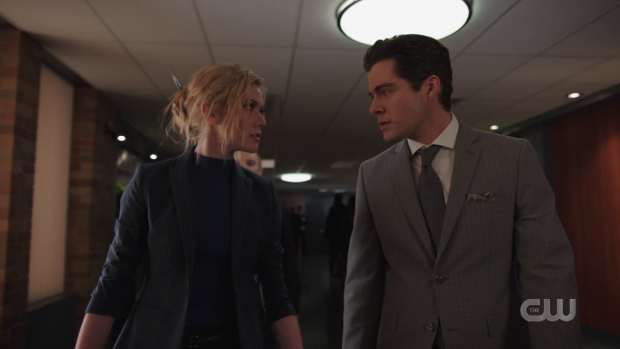 Ben Lewis and Katherine McNamara anchor the episode well with their relationship acting as the driving force for the plot. There are some on the nose moments such as when William takes joy in the prospect of her caring about him but on the whole their interactions feel natural enough. As a pairing they make for an effective counterbalance to one another. William is the level headed idea man and Mia lets her fists do the talking. This is a simplification of their purpose but it does summarise how they approach things. William tempers her volatility and she provides the muscle behind his intellectually based actions. Mia is clearly smart but William’s brand of intelligence fits the current situation far better. Last week was largely the other way around so it’s good to see characters used economically within the confines of the world the show presents. William taking on the persona of an arrogant CEO makes for fun viewing as Ben Lewis does a great job of bringing that to life. The way he casually brushes off the DNA scan while in the middle of discussing a big money merger shows his ability to navigate that world and blend in. Mia is less comfortable here as evidenced by her less than enthusiastic reaction at having to dress for the occasion and pretend to be subordinate to William. It reinforces the detail that she doesn’t like to be told what to do and is someone who prefers to take charge of a situation. In some ways that supports her decision to leave home as it was a situation that she had no control over. Ever since then she has tried to live life on her own terms and the joke about finding the thought of people assuming that she is William’s assistant feeds into that characterisation. The reveal that Connor is a government agent doesn’t entirely work as not enough is known about this character for his sudden appearance to have the impact that it needs. Mia clearly feels betrayed by this because he has apparently lied to them ever since they met. We as viewers have to take her word for that as we’ve seen very little their relationship. There is romantic subtext to Mia’s betrayal though it could equally be that she trusted him and now feels that the trust was misplaced. Either way this lacks impact despite the strong work done by the actors. Connor is pretty much a plot device that allows the characters to get past certain obstacles with little explanation. This is fine as it gives him a defined purpose but it is also limiting as it feels like there is little more to him than moving the plot forward. He does have a strong moment with Mia where he points out his perspective on being the child of a vigilante. His perspective is that being the child of a hero carries extra responsibility with it as they have to learn to share their parents with the rest of the world. He quotes Spider-Man’s famous motto “with great power comes great responsibility” as being the way he sees being the child of a hero. Mia sees Connor’s perspective as being skewed because he has been training to be a hero from a young age when she hasn’t though Connor counters that by suggesting that she actually has with the only difference being that Connor chose to be a hero when Mia had it thrust upon her. It’s a fairly superficial discussion made far better by strong performances anchoring it. The future version of Felicity is finally introduced and she hardly seems to have aged a day. It turns out that her warnings were to keep Mia and William away from the Glades rather than draw them to it which makes little sense as she was bound to know them well enough to conclude that this wouldn’t work. Her appearance here puts an end to the possibility of her becoming a villain as her entire plan is to save the city rather than destroy it. All told she doesn’t seem to have changed a great deal in the intervening years though there’s a suggestion that she’s trying to atone for something. The reveal that she created the dangerously intrusive Archer system answers that question and highlights the slippery slope that the present day timeline is on. Felicity and Mia’s relationship may not receive a lot of attention but Mia’s hatred of vigilantes and resentment of Felicity for lying about being one for her entire life is clear enough. She sees Felicity’s stories about how heroic Team Arrow were as being with the intention of manipulating her into not thinking badly of Felicity or Oliver. Finding out that Felicity lied to her prompted her hatred of vigilantes as a reaction to that sense of betrayal. By the end of the episode she starts to see how Felicity must have felt having the whole city turn on her and the rest of the team so has her mind opened somewhat to the complexities of the situation. 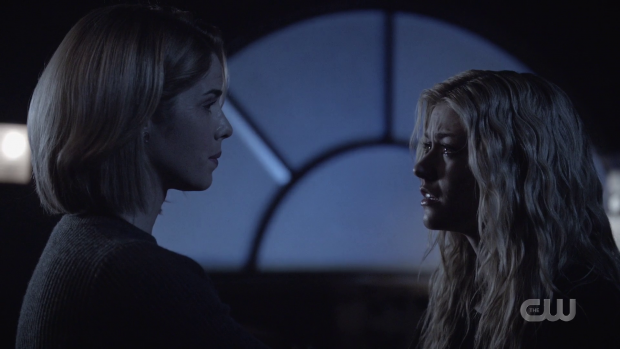 As with everything else this reconciliation might have meant more had more work been done to establish a baseline for their relationship throughout her upbringing but the scene itself where Mia sees Felicity’s point of view is really strong. Another thing the future narrative lacks is a strong villain. Galaxy just don’t feel distinct enough to stand out beyond any of the countless faceless criminal organisations this show has used in the past. There have been a few that have managed to achieve some sort of control of the city and look to exploit that. The most interesting thing going on here is that Rene has been clearly duped by an obvious deception. Dinah makes the point about him getting the age and not the wisdom which seems accurate enough though arguably out of character for Rene who is usually not so easily fooled in the present day. It’s possible that his idealism overpowered his better instincts which doesn’t quite work though the idea of a version of Rene so completely divorced from the person he once was is compelling. Having him make the difficult choice to start a manhunt for the vigilante team in order to keep up appearances helps highlight his position being far from easy and suggests that his position will grow more untenable as the episodes progress. His idea of evacuating the city and rebuilding it from the ground up in order to make it a far better place to live has a lot of merit. It’s all about restoration and improvement with no visible detriment to anyone living there other than being relocated for a period of time. Naturally Galaxy are simply planning to level the city with everyone in it which makes no real sense as plans go as there is surely no way that they can get away with it plus it’s unclear what they stand to gain from conducting a plan like that. It’s an evil act for the sake of an evil act to artificially create an antagonist for the characters in the future time period to fight against. 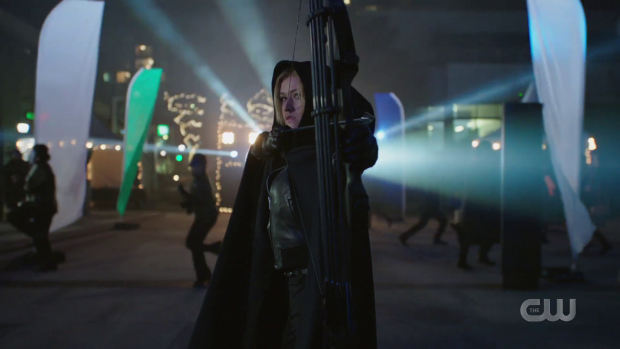 Once Rene realises that he has been lied to he sides with the vigilante team and looks to work with them to save the lives of those in Star City. This leads to a visually interesting party sequence where everyone wears elaborate costumes and races against the clock to stop the bombs going off. It’s appropriately tense and makes good use of the available characters while giving Mia badass hero moments through fight scenes and stopping the bombs at the last second using her skills with a bow and arrow. If this is the showcase for a potential 2040 set Arrow spinoff then there’s not quite enough there to carry a show on its own though plenty of the elements have potential to be expanded and developed along various lines. The core Mia, William and Connor dynamic could easily carry a show if more work was put into it but the relationships would have to be significantly deepened in order to allow an audience to be fully invested in them. I doubt this is serving as something of a backdoor pilot as I’m not convinced this future will actually come to pass. A mixed episode that offers little insight into Mia’s relationship with Felicity and fails to add much in the way of intrigue to the future plot but has great performances from the newer additions to the cast. Witnessing Mia’s birth followed by a montage of her upbringing is a real missed opportunity as there is no sense of her relationship with Felicity or Nyssa. It simply establishes that she grew up and was trained by Nyssa which offers an explanation for her skills but delivers little into emotional insight. Her reason for leaving home doesn’t work as there’s no grounding for her dislike of vigilantes and there is no baseline for her relationship with Felicity for her leaving to have the desired impact. The William/Mia dynamic does come across well as we are seeing this grow naturally from a defined beginning point. Some of the dialogue is painfully on the nose but on the whole they bounce off each other thanks to the strength of the actor performances. Introducing Connor as a government agent doesn’t really work because too little is known about this character for it to have the desired impact. Mia feeling betrayed comes across clearly enough but we haven’t seen enough of them interacting in order to let the weight of it sink in. There is a suggested romantic subtext to Mia’s reaction but there’s not enough information for that to matter. Their discussion about being the children of heroes is interesting enough on the surface and offers compelling perspectives on their upbringings. The future version of Felicity doesn’t seem to have changed all that much which clears up whether she becomes a villain or not in the intervening years. There’s a sense that she wants to atone for something which is answered with the reveal that she invented Archer. This makes her motivation clear in this time period. The discussion where Mia works through her feelings and starts to see Felicity’s perspective on vigilantes is a strong and brilliantly acted moment that gives a strong sense of their relationship in that particular moment. The future narrative lacks a strong villain. Galaxy fail to be interesting enough to stand out from the other powerful organisations in the show’s history. Rene being duped by an obvious deception works well enough as it highlights how much he has changed over the years and how he has lost the cynicism that defined him in his younger years. Once he learns that he was lied to he sides with the vigilantes but ends up making a difficult choice that puts them in danger in order to save face. It’s unclear what Galaxy expect to gain from levelling the city but it does provide an opportunity for a fun party sequence with a ticking clock that makes great use of the characters and allows Mia some impressive badass moments.